19 October 2018 – One of the enthusiastic walkers on our #SingTheCity fundraising walk for Gauteng Opera was Liz Belmont who wrote not one but two articles about it on the Liz At Lancaster website. Passionate, visionary, generous and inspiring are all words that come to mind when describing Josine Overdevest. For over 25 years (over 15 of these in South Africa), Josine Overdevest has worked in information and communication technology. Through her company Bamboo Rock, Josine works widely in digital development but she is particularly excited about the potential of digital technology in the educational sector and its potential for student and teacher development (something that is very dear to my heart). Seeing the difficulty that first-time employees have in entering the job market, she established Flying Cows of Jozi, an initiative which involves mentoring students in digital education projects. The postgrad students (all in the Education Faculty at the University of Johannesburg) have recently worked on educational material in the digital space for South African high schools. They have received glowing feedback on their work from no less a publishing luminary than Cambridge University Press. Josine’s passion for Jozi and the inner city (she lives around the corner from 1 Fox Precinct), is very evident when she takes occasional tours of the inner city. And Saturday 29th September her walk was a fund-raiser for much needed funds to enable Gauteng Opera students to continue their studies. Accompanying Josine (to help manage the errant and straying sheep in the group! ), were the student interns working for Flying Cows of Jozi. 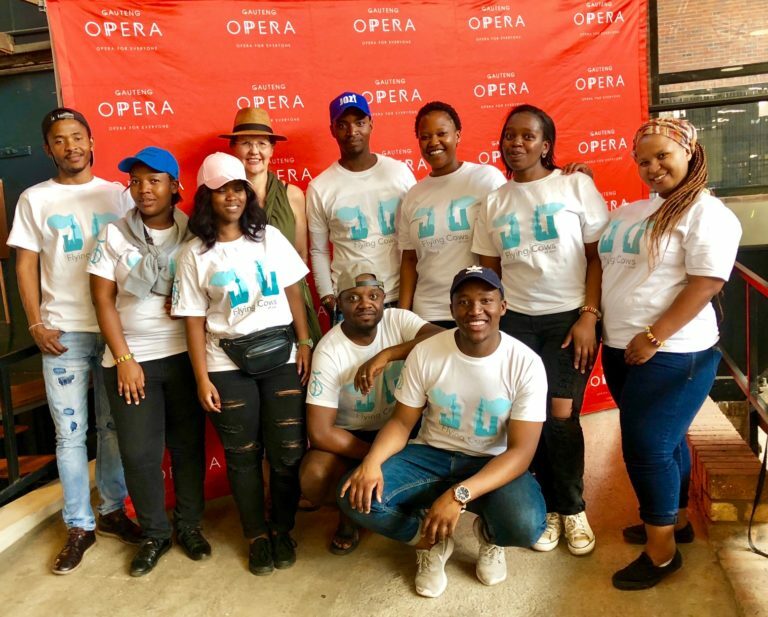 Both Flying Cows of Jozi and Gauteng Opera are based in Marshall town, and both organisations provide young people with education and personal development. With the walk the Flying Cows of Jozi students helped raised funds for the opera students to continue their studies with the Gauteng Opera Academy. Students helping students.